1. Heat a dutch oven (Le Creuset) with vegetable oil on medium high heat. Add carrots and onions and cook for 2 minutes. 2. Add the rest of the ingredients, stir, and bring to a boil. Reduce to a simmer and cook covered for 1 hour, stirring occasionally. Remove the cover and continue to simmer for 1 1/2 hours, stirring occasionally. 3. Remove from heat and use a spoon to spoon off the excess oil. Serve. We were inspired by a post on FXCuisine to buy a spaetzle scraper. This is our first time using it and even though I can only vaguely remember the one time I made it in culinary school, I felt daring and wrote my own recipe. This was mainly because I didn’t want to go out and buy any ingredients so it had to be made with what we had. The result was just as good as any spaetzle I’ve eaten. 1. Fill a 4 quart pot with water, salt it, and bring to a boil. 2. In a medium sized bowl, mix together dry ingredients. Set aside. In a small bowl, mix together half and half and water. Alternate between adding liquid mixture and eggs into the dry mixture. Mix until smooth. 3. Turn water down to a simmer. 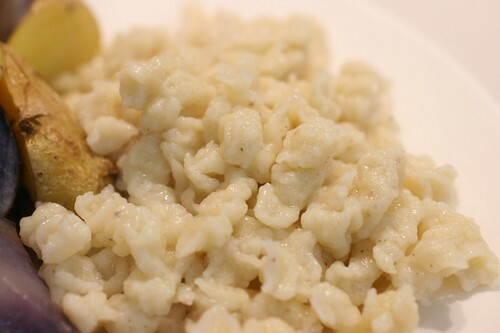 Press dough into a spaetzle scraper over the simmering water and cook for 4-6 minutes. Drain and serve. I threw in some roasted potatoes and it was the ultimate comfort food. We both stuffed ourselves with 2 or more plates like this. posted by jessica	at 12:42 AM	Filed under Eastern European, Recipes. You can follow any responses to this entry through the RSS 2.0 feed. Both comments and pings are currently closed. Thanks K&S;, it's so easy to make. 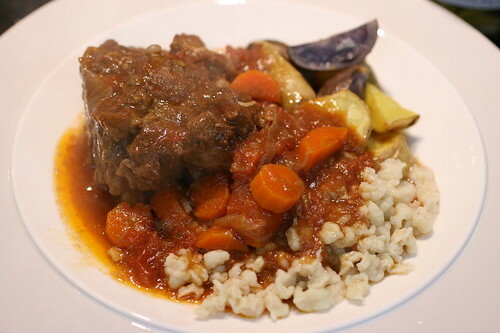 Do the Kosher butcher shops sell oxtails? glad it met with the hungarian’s approval. Grace, give it a try. Jess, that looks amazing!! Do you make Borscht soup? If so, can you send me a recipe? Sara, I’ve never made borscht but here’s a highly rated recipe. I grew up on goulash and borscht! Yours looks amazing, and good to see you found some great use for seasonal pluots! Thanks Dr. Food. Do you have a borscht recipe? Oh wow, that looks so good. I love oxtail. Yummm…. 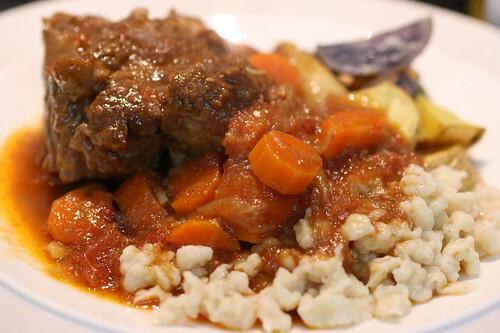 I haven’t cooked with oxtails before but have always wanted to try. And spaetzle have always piqued my appetite. Great-looking meal! Angie, will have to remember to make it for you next time. JS, oxtail is really easy to work with. Outstanding! It’s currently in the teens here in Kansas. This would warm me up. Muddywaters, ooh, that’s chilly, but perfect for some comfort food.